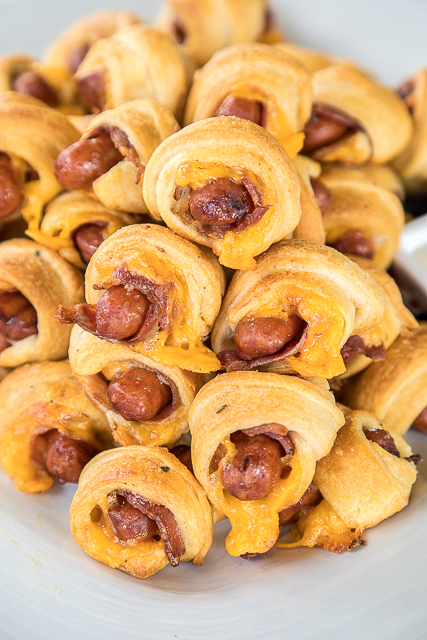 Pigs in a blanket are my kryptonite. I have zero self-control around a plate of pigs in a blanket. 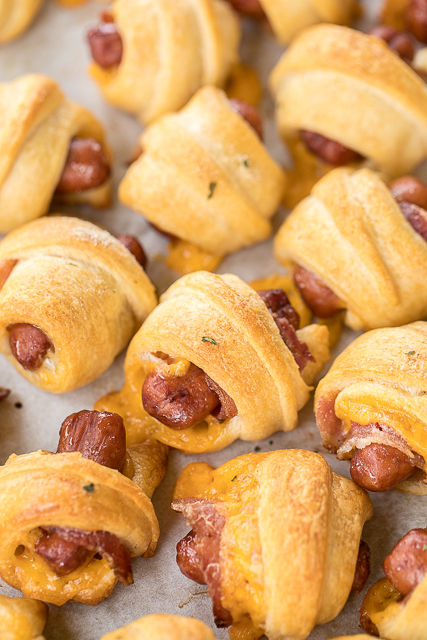 These Crack Pigs in a Blanket are next-level delicious! As you know, the “Crack” combination of cheddar, bacon and ranch is our all-time favorite. Combine that with my addiction to pigs in a blanket - HEAVEN!!! 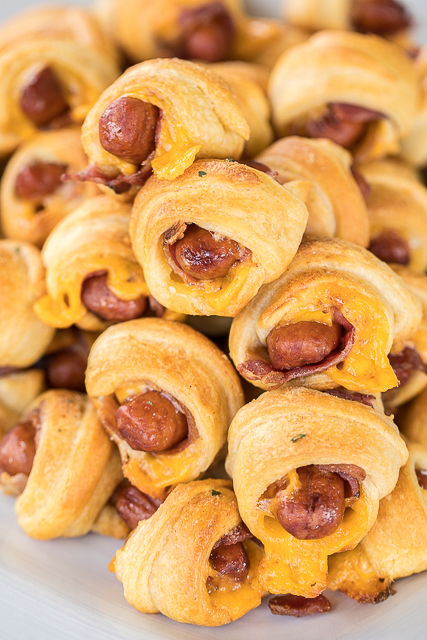 These Crack Pigs in a Blanket are super easy to make! 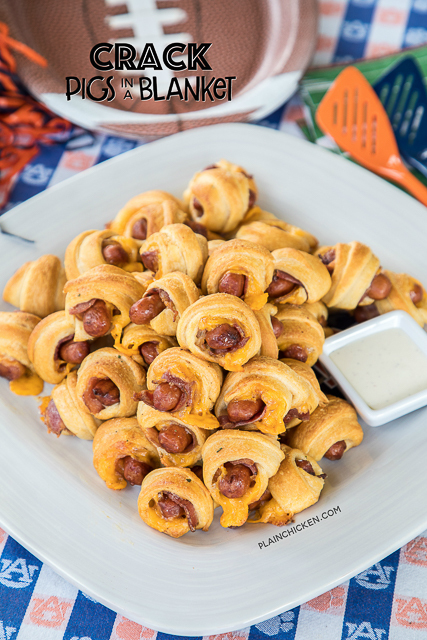 Crescent rolls, little smokies, bacon, cheddar and ranch dressing. They take about 5 minutes to prepare and about 15 minutes to bake. This recipe makes about three dozen Crack Pigs in a Blanket. Perfect for parties and watching all the playoff games. 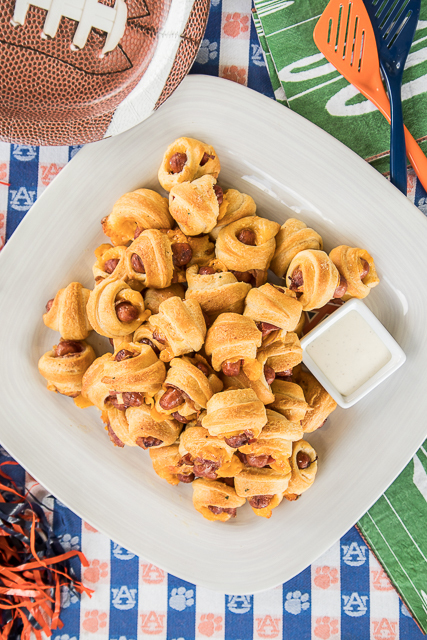 We are totally addicted to these Crack Pigs in a Blanket!!! They will be on our football menu every week up until the Super Bowl! YAY! Spread a heaping teaspoon of Ranch dressing on each triangle. Cut each triangle lengthwise into 3 narrow triangles. Place a slice of cheese on each triangle . Top cheese with a piece of bacon and a sausage on the wide side of each triangle. Roll up. Place on un-greased cookie sheet. You may have a few leftover strips of crescent roll dough. Oh, I would be in trouble with these. I also am dropping by to thank you for the Easy Potato Roll recipe as comments on that post are closed. The rolls are so easy to make and have replaced biscuits at my house. I make them at least once a week. They are great with butter and jam, under gravy, and I even snack on any leftovers cold. One of the best recipes I found in 2017. Also, I love your cats. We have 2.